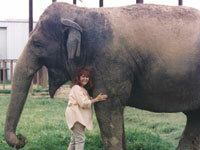 Pat Derby, co-founder with Ed Stewart of the wonderful PAWS and the ARK2000 sanctuary in California, passed away peacefully on February 15th after a two year battle with cancer. A kindred spirit and pioneer in the campaign against the use of animals in entertainment, Pat was both friend and colleague . ADI’s Jan Creamer and Tim Phillips were with Pat in January and to the end she continued to speak with excitement about the next important developments in the campaigns. Tim and Jan were honoured to speak at her memorial service in Sacramento paying tribute to Pat’s legacy alongside Kim Basinger and Bob Barker. We first joined forces with Pat and Ed for a press conference in the U.S. in 1998 about the abuse of circus animals, and so began a relationship that continues to this day. The animals have lost a great champion and our hearts go out to Ed and all at PAWS.